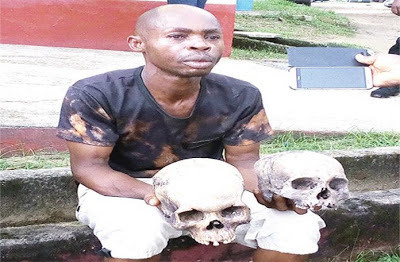 A self-acclaimed traditional healer, Edem Bassey Otu, arrested with two human skulls while allegedly preparing some cultists for an outing, said the Police have no right to arrest him because the skulls were left behind by his father, who died some eight years ago. Bassey Otu, who did not show any sign of remorse during the parade, chided the Police for arresting him, “I am a herbalist and I heal people of different sickness. I have my license to operate as a herbalist. 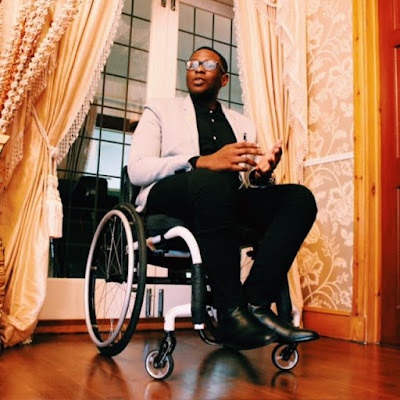 “Somebody ran in front of my house and the Police came to my house to arrest me. They have no right because I have been using these skulls for my job since my father left them for me some eight years ago,” Bassey said. Speaking on how he was arrested, the State Commissioner of Police, Mr. Hafiz Mohammed Inuwa, explained that the Police had received a distress call from an unknown number that some group of cultists were undergoing a fortification ritual and they immediately swung into action. He said that Anti-Cultism/Kidnapping squad swung into action and arrested Bassey at his number 12b Etim Edem Street in Calabar, while others took to their heels. His words: “On 27th June 2018 at about 1400hrs, we received a distress call from an unknown number that some group of cultists were undergoing a fortification ritual. “Anti-cultism/kidnapping squad swung into action and arrested one Otu Edem Bassey of 12b Etim Edem Street while others took to their heels,” the Commissioner said. The Police boss added that items recovered from the suspect include two human skulls, charms and other items used for incantation, assuring that he will soon be charged to court when the detectives conclude investigation into the matter.